The very attempt to reform an unstable, diminishing-return system often precipitates its collapse. Our collective interest in the rise and fall of empires is not academic. The meteoric rise of China and the financialization rotting out global capitalism are just two developments that suggest we are entering an era where some great powers will collapse, others will remake themselves and others will gain ascendancy. In How Empires Fall (April 17, 2013), I discussed Adrian Goldsworthy's How Rome Fell: Death of a Superpower and an old favorite on the same topic, Michael Grant's excellentThe Fall of the Roman Empire. Paul Kennedy's influential book from 1987, The Rise and Fall of the Great Powers, seeks generalizations about what causes the rise and decline of great powers, be they empires or nation-states. Kennedy avoids the temptation to extract grand theories from history, quietly mocking Wallersteins's "world systems" and related analyses. In this he follows fellow historian Fernand Braudel, who also hesitated to draw overarching theories from the messy history of capitalism. Kennedy proposes one mechanism that he claims does hold true over time: it's not the absolute wealth and power of any one nation or empire that matters, it's the economic growth rate of competitors and its wealth and power relative to theirs that matter. A nation whose economic base is growing at a lower rate than a competitor slowly become relatively weaker than its rival, even though its absolute wealth is still increasing. He also notes a tendency for powers in relative decline (i.e. those growing less robustly than their neighbors/rivals) to spend more on military security as their position in the pecking order weakens. This diversion of national surplus to military spending further saps their economic vitality as funds are shifted from investment to unproductive military spending. This creates a feedback loop as lower investment weakens their economic base which then causes the leadership to respond to this weakening power with more military spending. This feedback creates lags, where an economically weakening power may actually increase its military power, until the overtaxed economy implodes under the weight of the high military spending. This dynamic certainly seems visible in the history of the Soviet Union, which at the time of this book's publication in 1987 was unanimously considered an enduring superpower with a military that many believed could conquer Western Europe with its conventional forces. This debate over the relative superiority of Soviet arms now seems quaint in the light of the collapse of the USSR a mere four years later, but it worth recalling that one of the most influential defense-doctrine books of the early 1980s was The The Third World War: August 1985 a novel by Sir John Hackett, about a fictional Soviet attack on Western Europe in 1985. It was widely recognized by the late 1980s that the Soviets' relative power was in decline compared to the U.S., as the U.S. had worked its way through the malaise and restructuring of the 1970s and re-entered an era of strong economic and technological growth in the 1980s, rapidly outpacing the sclerotic Soviet economy. It's also worth recalling the truly dismal status of the Soviet and Eastern Bloc economies compared to the Western economies: common inexpensive consumer items such as kitchen toasters were rare luxuries. In other words, while the Soviet economy was probably still expanding in the 1980s, the rate and quality of its expansion was considerably less than the growth of the West. If one economy grows by 1% a year and another grows by 5% a year, in a mere decade the faster-growth economy will have expanded by more than 62%, while its slower-growing rival's economy grew only 10.5%. Many observers (especially on the Left, where suspicion of military spending is never far below the surface) see the U.S. as following this same path to decline and fall, as post-9/11 defense spending has skyrocketed while growth has stagnated. Despite what I see as wasteful spending on overlapping intelligence agencies and insanely costly programs like the F-35 fighter, U.S. defense spending remains around 5% of GDP (Pentagon/National Security budget is around $690 billion, GDP is around $15 trillion). Though statistics from the Soviet era are not entirely reliable, various scholars have estimated that fully 40% of the Soviet GDP was being expended on its military and military-industrial complex. During the height of the Reagan buildup, the U.S. was spending about 6% of its GDP on direct military expenditures. If you include the Security State (CIA, NSA, et al. ), the Veterans Administration and other military-related programs (DARPA, etc. ), the cost was still less than 10% of GDP. How about America's position relative to other Great Powers or alliances? 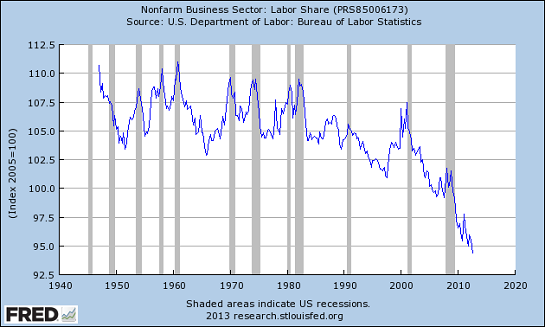 Interestingly, America's decline has been noted (and predicted) since the 1970s. Other nations such as Japan were growing much faster and were expected to overtake the U.S., based on the extrapolation of high growth rates into the future. Once again the same predictions are being made, only this time it is China that is logging high annual growth rates that are being projected far into the future. The more things change, the more they remain the same. Kennedy ends his book with a brief chapter looking ahead from 1987. He is careful not to make any outright predictions, but it is fair to say that he completely missed the bursting of Japan's miraculous high growth economy and the implosion of the Soviet Union a mere four years later in 1991. With the benefit of hindsight, we can discern the dynamics that led to these abrupt declines of relative power. But at the time, Japan's economy was universally regarded as superior to the U.S. economy and the USSR was widely viewed as a permanent superpower rival to the U.S.
How can we be so wrong about projecting present trends when we have so much data at our disposal? Why can't we identify the trends that end up mattering? 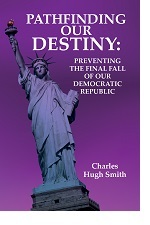 Reading political-economic history books written a few decades ago reinforces our humility: we cannot predict the future, except to say that projecting present trends leads to false predictions. Virtually no one in 1987 foresaw the limited Internet of the time exploding into a globally dominant technology, yet a mere decade later the web browser, cheaper memory, faster processors and broadband cable and DSL launched a digital revolution. In 1987, pundits were predicting that Japan's "5th generation" computing would soon dominate what was left of America's technological edge. They were spectacularly wrong, as the 5th generation fizzled and Japan became an also-ran in web technology, a position it still holds despite its many global electronic corporations and vast university research system. Japan's modern economy was set up in the late 1940s and early 1950s to exploit the world of that time. Sixty years later, Japan is still a wealthy nation, but its relative wealth and power have declined for 20 years, as its political-financial power structure clings to a model that worked splendidly for 40 years but has not worked effectively for 20 years. The decline is not just the result of debt and political sclerosis; Japan's vaunted electronics industry has been superseded by rivals in the U.S. and Korea. It is astonishing that there are virtually no Japanese brand smart phones with global sales, and only marginal Japanese-brand sales in the PC/notebook/tablet markets. The key dynamic here is once the low-hanging fruit have all been plucked, it becomes much more difficult to achieve high growth rates. That cycle is speeding up, it seems; western nations took 100 years to rapidly industrialize and then slip into failed models of stagnation; Japan took only 40 years to cycle through to stagnation, and now China has picked the low-hanging fruit and reverted to financialization, diminishing returns and rapidly rising debt after a mere 30 years of rapid growth. There is certainly evidence that China's leadership knows deep reform is necessary but the incentives to take that risk are low. Perhaps that is a key dynamic in this cycle of rapid growth leading to stagnation: the leadership, like everyone else, cannot quite believe the model no longer works. There are huge risks to reform, while staying the course seems to offer the hope of a renewal of past growth rates. But alas, the low hanging fruit have all been picked long ago, and as a result the leadership pursues the apparently lower-risk strategy that I call "doing more of what has failed spectacularly." Though none of the historians listed above mention it, there is another dangerous dynamic in any systemic reform: the very attempt to reform an unstable, diminishing-return system often precipitates its collapse. The leadership recognizes the need for systemic reform, but changing anything causes the house of cards to collapse in a heap. This seems to describe the endgame in the USSR, where Gorbachev's relatively modest reforms unraveled the entire empire. But in most cases, the individuals' lives are entirely non-linear: some decades they do less well, in others they do much better, and the dynamics that arise and dominate each stretch of their lives are not very predictable. This series reinforces our humility about predicting the life paths of individuals. So is there a unifying theme here? I would say yes, and it is embodied in this quote from Charles Darwin, co-founder of our understanding of natural selection and evolution: "It is not the strongest of the species that survives, nor the most intelligent, but the ones most adaptable to change." This essay is excerpted from Musings Report 16. The Musings Reports are basically a glimpse into my notebook, the unfiltered swamp where I organize future themes, sort through the dozens of stories and links submitted by readers, refine my own research and start connecting dots which appear later in the blog or in my books. If you'd like to receive the weekly Musings Reports, please subscribe ($5/month) via the links in the right sidebar or send $50 (the annual one-payment subscription fee) via the PayPal link. 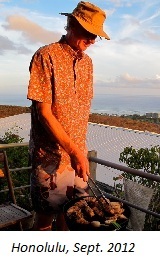 Thank you, Chris in Marin ($100), for your outrageously generous contribution to this site -- please email me if you would like to receive the Musings Reports. Thank you, Andrew F. ($50), for your spendidly generous contribution to this site -- I am greatly honored by your support and readership. A system that suppresses dissent is fault-intolerant, ignorant and fragile. Increasing centralization has been viewed as the solution for all social and economic problems for quite some time. The Eurozone project is one recent manifestation of this belief. The basis of this belief is rationality and efficiency. If we centralize production and decision-making, we eliminate all sorts of inefficiencies. Decisions can be made by "top people," and supply chains can be rationalized from a hopelessly inefficient clutter down to a supremely rational and cost-effective pathway. Ironically, in eliminating inefficiency and messy decision-making, centralization eliminates redundancy, decentralized pathways of response and dissent. Once you lose redundancy and all the feedback it represents, you lose resiliency and fault-tolerance. The centralized system is fault-intolerant and fragile. By rationalizing decision-making and authority in a centralized hierarchy, the system slowly but surely eliminates dissent: those who "don't get on board" and "get with the program" imposed from the top are marginalized, pushed out or liquidated. From the point of view of the "top people," this is merely rational; why tolerate a lot of chatter and resistance that doesn't serve any real purpose except to bog down the duly chosen program? As Nassim Taleb has observed, dissent is information. Eliminate or marginalize dissent and you've deprived the system of critical information. Lacking a wealth of information, the system becomes a monoculture in which the leadership is free to pursue confirmation bias, focusing on whatever feedback confirms its policy mandates. A system that suppresses dissent is fault-intolerant, ignorant and fragile. Any event that does not respond to centralized, rationalized policy creates unintended consequences that throws the centralized mechanism into disarray. Lacking dissent and redundancy, the system piles on one haphazard, politically expedient "fix" after another, further destabilizing the system. 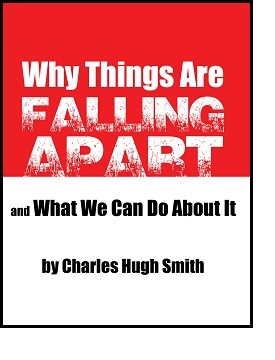 The event that triggers crisis and collapse isn't important; the system, rendered unstable and fragile by centralization, is primed for crisis and collapse. The dry underbrush is piled high, and if the first lightning strike doesn't start the fire, the second one will. With dissent and the inefficiencies of redundancy and decentralized pathways of response gone, there is nothing left to stop a conflagration that consumes the entire forest. Thank you, Mark H. ($10), for your very generous contribution to this site -- I am greatly honored by your support and readership. Thank you, John P. ($10), for your most generous contribution to this site -- I am greatly honored by your support and readership. 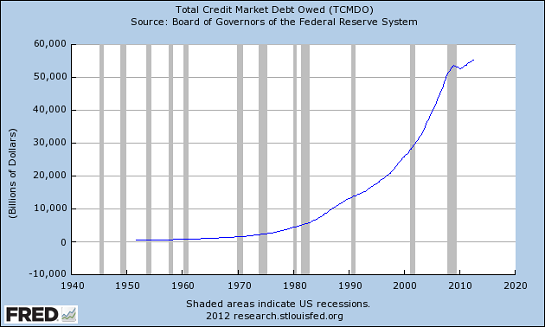 The wheels have come off the endless growth via expanding debt machine. Progressives and conservatives have long shared a single agenda: growth. Growth increases prosperity and wealth, and this makes for contented voters who will keep voting for incumbents. 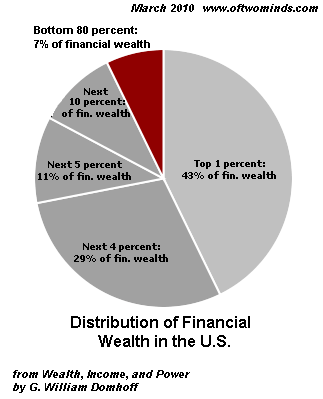 It's important to understand the distinction being made here between relative and absolute wealth: if the top 10% own 90% of the wealth, then $90 of every $100 of new wealth flows to them. This is politically acceptable to the status quo as long as the wealth of the bottom 90% expands by the same percentage. Should the bottom 90%'s share of the new wealth rise at a faster rate than the top 10%'s, that's actually preferable, as over time that shrinks wealth inequality while leaving the wealth already owned by the top 10% untouched. In other words, the top 10% do not suffer any decline in wealth if they collect $80 of each $100 of new wealth rather than $90. This slight reduction in the rate of growth makes little difference to the top wealth holders but it has a much larger impact on the bottom 90% because they own so little wealth. Every one of these implicit assumptions has been turned on its head: growth is barely above the rate of inflation; by some measures, it has already fallen below the real rate of inflation. 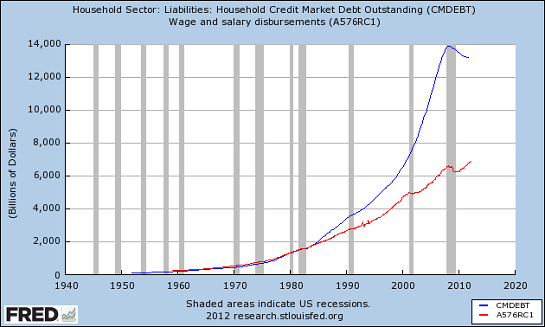 Debt is increasing much faster than income or wealth. 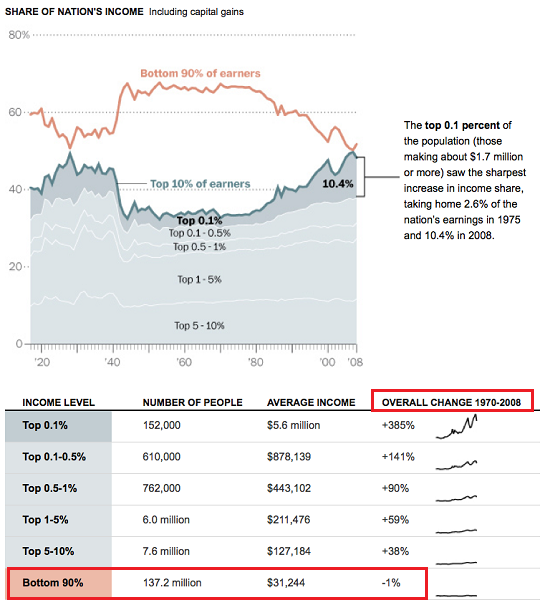 Virtually all of the recent expansion of wealth/income is flowing to the top 10%. This is why the status quo is doomed: there is no Plan B or even conceptual alternative to the "more growth forever" agenda. 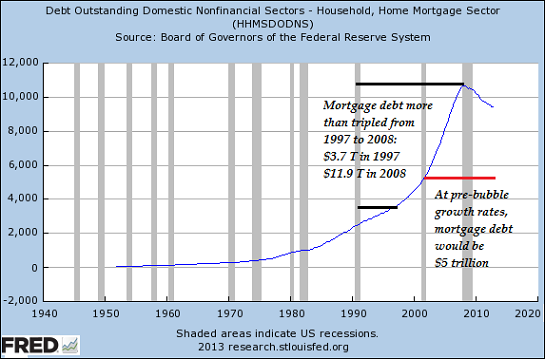 The real financial situation is considerably bleaker than the conventional view maintains. Federal debt is only the tip of the iceberg: the killer liabilities are the unfunded liabilities for Medicare and Social Security which are estimated at $87 trillion--a number I suspect understates reality, but which is larger than all U.S. household wealth. 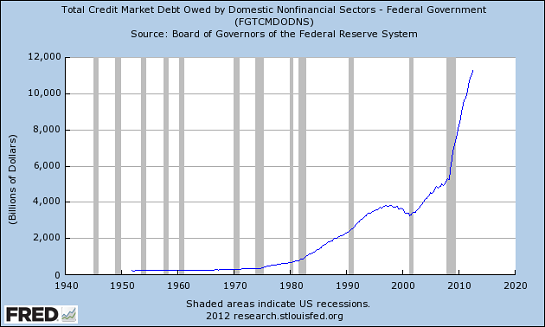 Does this trajectory of Federal debt look sustainable? The oft-touted fantasy is that "we're going to grow our way out of this," but it is abundantly clear that debt is rising far faster than growth or incomes. Financialization has widened the wealth inequality canyon to the point that the 95% on one side can no longer see the other side through the haze of propaganda and political fog. Those relative few on the other bank can no longer see the 95%, either; and since the political and financial Elites are on this side, they are rapidly losing touch with the 95% and the real (i.e. unfinancialized) economy. Thank you, Brian S. ($5/month), for your gloriously generous subscription to this site -- I am greatly honored by your support and readership. Thank you, Fred M. ($25), for your superbly generous contribution to this site -- I am greatly honored by your support and readership. Rising mortgage rates reduce household purchasing power just like higher taxes and inflation. Mortgage rates have jumped significantly in the past few weeks, from 3.50% at the beginning of May to the current rate of 4.875% for conventional Fannie Mae mortgages. These are the two rates quoted by a mortgage broker in Mish's recent post on rising mortgage rates. Interest rate of 4.875%: This is an increase of 1.375%, which represents a 39% increase over the initial rate of 3.50%. The monthly payment rose by $240.49, or 14.6%. While unwelcome, that in itself doesn't seem like much. But look at the lifetime cost increase: $86,576, all extra interest of course. This relatively modest increase in mortgage rates to a still low by historical metrics 4.875% will reduce the purchasing power of the household by $240. Over time, $86,000 in additional interest payments will be transferred from the household to the lender/ owner of the mortgage. We are constantly told inflation is near-zero, but a decline in purchasing power is equivalent to inflation. If one's labor buys fewer goods and services, then saying inflation doesn't exist is merely a semantic victory. In other words, the $240 reduction in the household purchasing power due to rising rates has the exact same effect as inflation that reduced the household's monthly income by $240/month. Over time, rates on the roughly 48 million outstanding mortgages in the U.S. will rise. There are still millions of adjustable rate mortgages out there, often second mortgages or home-equity lines of credit (HELOCs). Those will start ticking higher in the months ahead. $240 a month ($2,880 a year) may not seem like much, but multiply that by a million, and then by many millions, and the number starts becoming consequential: that money is no longer available for consumption or investment. Rising mortgage rates reduce household purchasing power just like higher taxes and inflation. That means there is less household income to spend on other things, and that's not good for "growth." Thank you, Steve D. ($10), for your most generous contribution to this site -- I am greatly honored by your support and readership. Thank you, Schuyler G. ($25), for your extremely generous contribution to this site -- I am greatly honored by your support and readership. Financialization is the disease eating away the heart of the economy and what's left of democracy. There are a number of factors behind the widening canyon of economic inequality, but the primary driver is financialization. Financialization has given those with capital and access to financier expertise ways to skim great wealth from the system without creating any value whatsoever. Those with a home that is owned free and clear and $500,000+ in a 401K or retirement account have more capital than the vast majority of Americans, but members of the upper-middle class have no access to the leverage and tools of financialization. In other words, financialization isn't a consequence of having capital: it's the consequence of having access to unlimited credit, leverage and low-risk, low-tax skimming operations (for example, tax codes enable hedge funds to declare income as low-tax long-term capital gains). From the financier point of view, the upper-middle class tax donkeys who keep all their investment capital in mutual funds are the marks who supply liquidity to the system. The wealthy who park money in hedge funds are marks of a higher order, as their cash enables fund managers to gamble with other people's money and then return a thin slice of the gains (if any, after fees) back to the investors. A carry trade is a classic skimming operation. The term is based on the difference between the costs of holding (carrying) one position and the gains earned by investing the proceeds elsewhere. To define this term, "carry trade", for those who are a bit newer to the markets, it consists of borrowing large amounts of Yen for extremely low costs due to the miniscule short term interest rate in that nation, and taking those proceeds, exchanging it into different currencies and then using that money to make investments elsewhere where higher yields may be obtained. If that is not risky enough, most of these hedge funds then leverage their speculative bets in the hopes of compounding their gains. There is a risk to currency carry trades: if the currency you borrow appreciates, then the trade blows up as the exchange rate loss exceeds your interest rate gain. The yen carry trade expanded to an estimated $1 trillion because the dollar/yen exchange rates were relatively stable. The sweetest carry trades occur when two currencies are officially pegged but there is a big difference in interest rates between the two currencies. The lack of volatility in the exchange rate lowers the risk of this trade to near-zero--until the peg blows up. Would you like to leverage a carry trade 10 to 1? Hmm, who will loan you $1,000,000 based on $100,000 collateral? That's a key feature of financialization: the real power--leverage and access to global markets--is not available to you. The skimming operations are only open to the financier class. Leveraging phantom collateral is another feature of financialization. Commoners were allowed a taste of this when subprime lenders were offering no-document, no-down payment mortgages back in 2004-2007. Phantom income was posted as collateral for the nothing-but-leverage loan. The same sort of trade appears to be occurring in China, where a warehouse of copper is pledged as collateral for a legitimate bank loan at a rate of 4.5%. 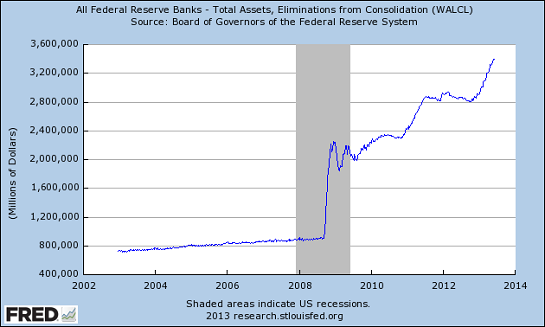 The proceeds are then loaned out at 10% (or higher) in the shadow banking sector of informal, unregulated credit. What's to keep several people from pledging the same warehouse of copper? Nothing. Leverage and high-finance skim operations do not require much capital. It takes essentially no capital to originate a derivative; just craft the thing to protect your interests and sell it to some money manager as a valuable hedge. If you have the right position and tools, it doesn't even require collateral to access gargantuan trading lines of credit. 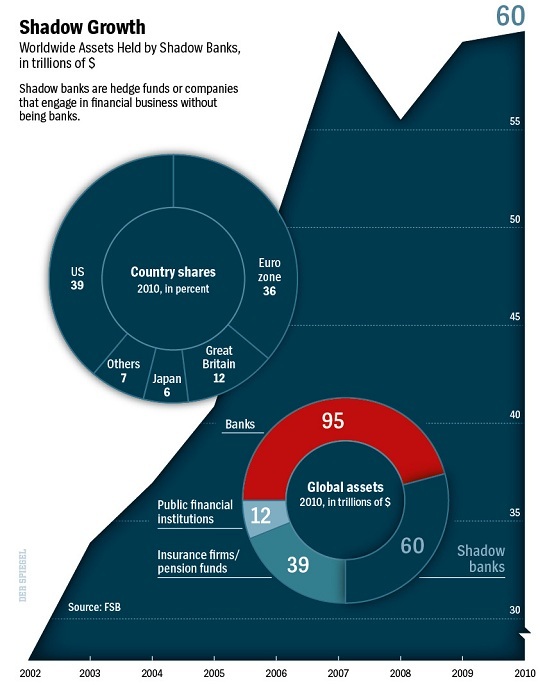 The point is financialization is about leverage and skimming the existing system for immense profits. It's not about hedging legitimate industries' risks or investing in productive enterprises; it's all about skimming wealth while providing no value to the real economy or society. The hidden toxin in financialization is the resulting concentration of wealth can buy concentrations of political power. Financialization is thus self-perpetuating: once the skimming operations generate billions of dollars in profit, it only takes a relatively small piece of these profits to buy/influence the political class. Once the politicos are in your pocket, the regulators and judiciary fall into line or are marginalized by new statutes or gutted budgets. When Congress dared to question hedge funds' primary tax break (declaring income as long-term capital gains), the industry went apoplectic and declared capitalism, Mom and apple pie were all at grave risk if their skimming operations were taxed at the same rate you and I pay on our income. Thank you, Peter G. ($20), for your extremely generous contribution to this site -- I am greatly honored by your support and readership. Thank you, James A. ($10/month), for your outrageously generous subscription to this site -- I am greatly honored by your support and readership. Many observers focus on the economic causes of the widening wealth inequality, but the divide appears to be both cultural and financial. To say there are haves and have-nots and two major political camps does not distinguish this era from any other. But despite this surface similarity to previous eras, there is a palpable zeitgeist that the nation is bifurcating into two camps which no longer overlap or communicate using the same cultural signifiers and symbology. Just as clearly, labor's share of the national income has been declining sharply: unearned income from capital is reaping more of the national income as the share earned by labor shrinks. Politically, I have long commented on the rising political divide not between the "two sides of the same coin" parties but between those who depend on and support the Savior State and those who pay the majority of taxes that fund the Savior State. This has created the divide feared by the Founding Fathers, The Tyranny of the Majority. A neofeudal Elite rules the roost but the Savior State buys the complicity of the lower classes with entitlements and social programs. According to demographer Joel Kotkin, California has become a two-and-a-half-class society, with a thin slice of "entrenched incumbents" on top (the "half class"), a dwindling middle class of public employees and private-sector professionals/technocrats, and an expanding permanent welfare class: about 40% of Californians don't pay any income tax and a quarter are on the Federal Medicaid program.I would break it down somewhat differently, into a three-and-a-half class society: the "entrenched incumbents" on top (the "half class"), the high-earners who pay most of the taxes (the first class), the working poor who pay Social Security payroll taxes and sales taxes (the second class), and State dependents who pay nothing (the third class). In other words, if the citizenry cannot dislodge a parasitic, predatory financial Aristocracy via elections, then "democracy" is merely a public-relations facade, a simulacra designed to create the illusion that the citizenry "have a voice" when in fact they are debt-serfs in a neofeudal State. Many observers focus on the economic causes of the widening wealth inequality, but the divide appears to be both cultural and financial. Author Charles Murray describes a cultural divide that informs the political and economic divides that are obvious to all in his book Coming Apart: The State of White America, 1960-2010. Murray has collected evidence that Caucasian America has bifurcated into cultural/social haves and have-nots: the haves are married, have college degrees, avoid military service, are less likely to attend religious services, and have little contact with those outside their own upper-middle class. 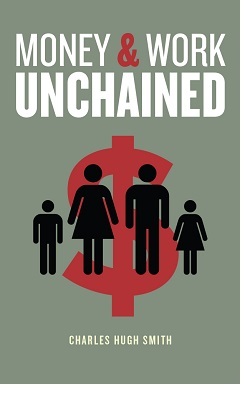 The have-nots are divorced/single parents, less educated, are more likely to serve in the military and attend church, and earn much less than the haves. The social glue that binds the nation includes these core values: the Constitution (and particularly the Bill of Rights), that no one is above the law, and upward mobility, that anyone born without privilege or wealth can attain status, wealth and power by exerting their own will and initiative. 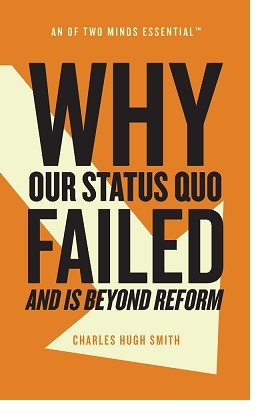 What Murray suggests is not that upward social mobility has ceased, but that it's become more difficult for the have-nots to join the haves, not necessarily for lack of opportunity but for the values-based reasons he describes. In my analysis, the cultural upper class has the income and connections to build abundant human and social capital, while the lower class has neither the values-tools, income or connections to assemble these critical building blocks of wealth. This sociological/economic reality is ideologically inconvenient on a number of fronts, largely because it ties "personal choice" issues such as marriage to what appears to many to be a strictly economic issue. A growing number of San Franciscans are fed up, not just with startups, but with techies in general. With their apps and (company) buses, their gourmet coffee and skinny jeans, their venture capital wishes and IPO dreams. They're tired of watching rents soar, friends forced to relocate and beloved neighborhoods drained of diversity.I understand the frustration, but wonder: Are we embracing a soft xenophobia applied to a sector rather than a race, to some cohesive elite tech class that doesn't exist outside of our own minds? Sometimes the Google Bus just seems like one face of Janus-headed capitalism; it contains the people too valuable even to use public transport or drive themselves. In the same spaces wander homeless people undeserving of private space, or the minimum comfort and security; right by the Google bus stop on Cesar Chavez Street immigrant men from Latin America stand waiting for employers in the building trade to scoop them up, or to be arrested and deported by the government. Both sides of the divide are bleak, and the middle way is hard to find. I think Solnit's point touches on two key dynamics: the shrinking middle, and the casual privilege of those with earning power and the resentment of the increasingly powerless. This is hardly unique to America: Priced out of Paris: global cities pricing out the upper-middle class. Is this the result of capitalism? The question is an active one, for example Capitalism and Inequality: What the Right and the Left Get Wrong (Foreign Affairs, March/April 2013; the article is behind their paywall; check out a copy at your local library). While capitalism certainly rewards the most productive (in the context of whatever incentives are in place) and creatively destroys what is no longer productive/profitable, we have to differentiate between classical open-market capitalism and the state-cartel (crony) version that is passed off as capitalism for PR purposes. 1. 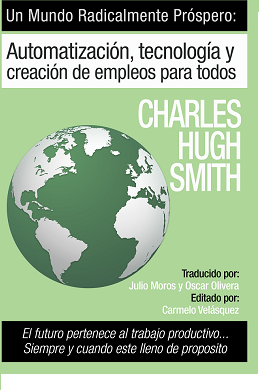 Automation, software and robotics are eliminating human labor on a vast scale. 2. Financialization has given those with capital and access to financier expertise ways to skim great wealth from the system without creating any value whatsoever. 3. The emerging economy gives tremendous advantages to those with ample human and social capital and the value system that enables them to continue adding to their human and social capital throughout their working lives. Those without these skills and values will increasingly be marginalized. These are dynamics that don't track neat ideological lines, nor do they lend themselves to tidy, simplistic solutions. Before we propose fixes, perhaps we need to do more work on understanding the many interconnected feedback loops in the widening bifurcation of the nation. Thank you, Steve L. ($25), for yet another supremely generous contribution to this site -- I am greatly honored by your steadfast support and readership. Thank you, David E. ($5), for your very generous contribution to this site -- I am greatly honored by your support and readership. It's as if we have two economies: the simulacrum one of stocks rising dramatically in a few months, and the real one of household earnings (down) and hours worked (down). It is difficult to justify the feeling that we are living in an extraordinary moment in time, for the fundamental reason that it's impossible to accurately assess the present in a historical context. Extraordinary moments are most easily marked by dramatic events such as declarations of war or election results; lacking such a visible demarcation, what sets this month of 2013 apart from any other month since the Lehman Brothers' collapse in 2008? It seems to me that the ordinariness of June 2013 is masking its true nature as a turning point. Humans soon habituate to whatever conditions they inhabit, and this adaptive trait robs us of the ability to discern just how extraordinary the situation has become. In my 59-year lifetime, the dramatic, this-is-history-happening moments are obvious: the Kennedy assassination, 9/11, and so on. Other tidal changes developed over a period of months or years: Watergate, which ballooned from a minor break-in to a constitutional crisis, is a good example. So is the financial meltdown of 2008, which actually began back in 2001 when the Federal Reserve chose a policy of super-low interest rates and super-abundant liquidity to lessen the post-dot-com recession. I have an unavoidable sense that May-June 2013 is the high water mark of the political/financial response to the global financial meltdown of 2008. Nothing systemic has changed in the five years; the status quo financial and political systems have made cosmetic reforms, but the power structures have not changed at all. 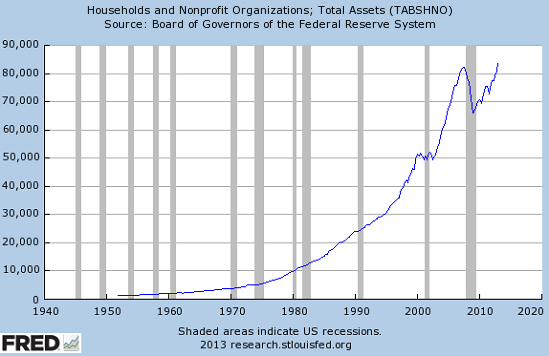 The status quo has simply ramped up its traditional policies: since lowering interest rates didn't spark a strong recovery, then lower rates to zero, and so on: more money creation, more credit creation, more bond purchases, more subsidies for housing, more transfers of private debt to the public ledger--more of what has failed spectacularly. That's what marks June 2013 as extraordinary: the Powers That Be have gone all-in. If their policies fail to ignite a self-sustaining recovery in the real economy, there are no policy options left. Those who don't follow finance might not have noticed the extraordinary nature of recent financial events: Japan's stock market rose by 75% since December before reversing sharply, the U.S. S&P 500 climbed 24% in 2013, gold crashed by over $200 in a matter of hours, and the Japanese yen has lost a quarter of its value (in U.S. dollars) in a matter of months. None of this makes sense in terms of the real economy: U.S. corporations didn't suddenly become 25% more profitable; Japan's economy did not expand by 75% in five months, and none of the fundamentals in the value of gold suddenly changed overnight. 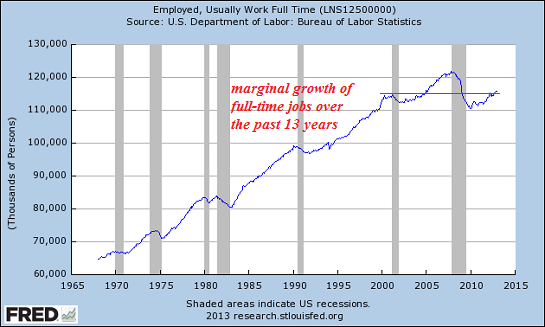 These rapid, gargantuan fluctuations are disconnected from the real economy. This in itself is extraordinary. The financial press explains these bubble-like advances and collapses in terms that only make sense to financiers: the yen-dollar pair, the yen carry trade, etc. That complex, abstract financier policies and trading strategies now dominate stocks, bonds and precious metals is also extraordinary. I have endeavored to understand the fundamentals behind these wild fluctuations proposed by the media, and have concluded none of it makes any sense in conventional economic terms. To mention just one example: gold has traditionally been viewed as a hedge against inflation. Gold's collapse is being attributed to lower expectations of inflation. OK, so there's no inflation, ergo, the global economy is in slow-growth/no-growth mode, hence no inflation. Then what is powering global stocks higher? 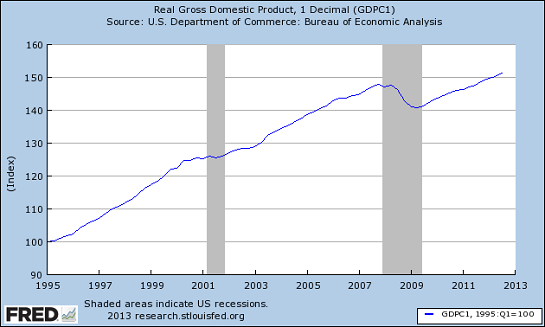 We're told "an improving global economy" is the driving force, but the data on this supposed recovery is mixed at best. Some observers claim gold dropped because the yen dropped and the U.S. dollar strengthened, but a glance at the 10-year chart of gold and the dollar quickly disproves any correlation: gold rose when the dollar dropped and when it rose. This is another extraordinary thing about the present: none of these moves make any sense. Pundits and analysts are seeking explanations after the fact, postulating correlations as causes with little historical backing. It's as if the financial media is incapable of confessing none of this makes sense, and instead the media piles one complex explanation on top of another to justify what is clearly an extraordinary disconnect between the real economy and asset valuations. Bottom line: even if the global economy is improving (and there is ample evidence that data is being juiced or manipulated), it isn't improving enough to justify stocks rising by 25% to 75% in a matter of months. 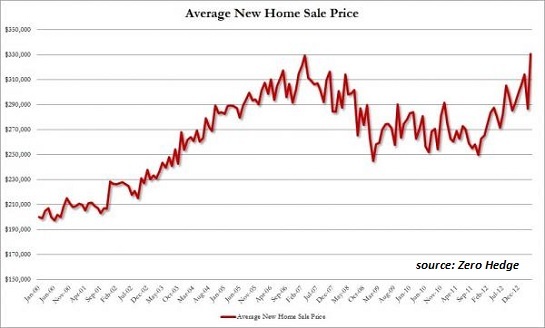 Real estate is also back in bubble territory, in those markets with plentiful capital and limited inventory: we're back to bidding wars and dozens of people competing for the right to buy an ordinary home. The bond prices of fatally insolvent European governments have fallen, as if these economies have suddenly been restored to health and fast growth by European Central Bank (ECB) intervention. European stock markets are roaring higher as well. Neither makes any sense in terms of traditional risk-pricing, price-earnings ratios and so on. 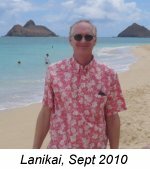 We are living in an extraordinary global financial experiment, in which financier tricks (zero interest rates and massive injections of credit and liquidity) have been pushed to their red-line limit in the hopes that these extraordinary measures will finally, after five long years, trigger a self-sustaining expansion of the real economy. Those in charge of the experiment are constantly reassuring us it has already succeeded. I think the data shows the experiment is in the final blow-off stage in which the beaker full of toxic ingredients is bubbling with dangerous vigor. There is one last extraordinary feature of this time: the data "proving" the experiment is successful is self-referential: drop interest rates to zero and subsidize housing, and voila, you get a surge in building permits. Take one full-time job and turn it into 1.5 part-time jobs, and voila, the unemployment rate declines and the number of jobs increases. Then take these metrics (higher permits and jobs), weigh them heavily in your measure of leading indicators, and then declare the leading indicators "prove" the recovery is self-sustaining. All this leads to a question: what would happen to the economy if all the financier tricks were stopped, and the price of risk, credit, assets, etc. were discovered by the marketplace? It's as if we have two economies: the simulacrum one of stocks rising 75% in a few months, and the real one of household earnings (down) and hours worked (down). Eventually these two economies will have to merge into one. I sense 2013 will be the critical year when the schizophrenia is resolved one way or the other. This essay is excerpted from Musings Report 20. The Musings Reports are basically a glimpse into my notebook, the unfiltered swamp where I organize future themes, sort through the dozens of stories and links submitted by readers, refine my own research and start connecting dots which appear later in the blog or in my books. Thank you, Jeremy B. (silver coins), for your supremely generous contribution to this site -- I am greatly honored by your steadfast support and readership. Thank you, Richard H. ($50), for your splendidly generous contribution to this site -- I am greatly honored by your support and readership.